Please read the following before having an item stripped. Since the late 1980s many of these stripped doors have now been repainted and the choice of paints has changed dramatically to include water-based and cellulose based paints, for example. These can sometimes create a problems if you now choose to re-dip your door. Water- based paints are very hard to remove, simply because they are water-based producsts and the process of stripping a door is mainly carried out using a very diluted chemical in water. 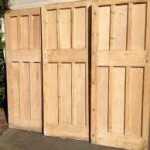 Cellulose is diffiuclt as it sinks into the top few mm of the door and clings; hence some doors strip hardly at all whilst in others it may lift the grain. This is more noticeable on modern doors and furniture. If the grain does lift the item will be ok, however there is then quite a considerable amount of preparation to be done. Colour- based stains, particularly the mahogany based stains, are almost impossible to remove - this very heavy red dye has sunk into the surface of the door. All doors that have had any of these treatments therefore come with a warning as once the process of stripping has started we cannot stop it. Finally sometimes it is just impossible to tell whether a door has had these types of treatment, (perhaps you have just moved house and don't know) so we all then unfortunately just have to take a chance. Oak and mahogany do not strip well, in fact we highly recommend you not to use this method. We do however run a hand- stripping service and although this is a more expensive option (it uses more costly chemicals and is carried out by hand) it produces brilliant results with hardwoods and leaves you to do very little further preparation as well as maintaining the value. Another benefit worth considering is that this method will lighten oak etc., making its appearance fit in well with modern decor.